Tucked in Denali State Park, the Alaska Veterans Memorial honors Alaska&apos;s veterans in a big way. Many Alaskans have driven right past the memorial, located at Mile 147.1 Parks Highway, without ever stopping. They should stop, because the memorial is an interesting peak into the military history of Alaska. Built in 1983, the memorial features five towering 20-foot tall concrete panels, representing the Army, Navy, Air Force, Marines and Coast Guard, arranged in a semi-circle. On each of the panels, there is a star cutout, and a description about the historical importance each branch of the military has had on Alaska. The tactful layout of the memorial is impressive and gives visitors a somber feeling in a way. The walkway leading up to the monuments has beautiful views of the Alaska Range and Denali. There are also memorials for veterans who lost their life in military aviation accidents in Alaska, and Alaska veterans who have been awarded the Medal of Honor. 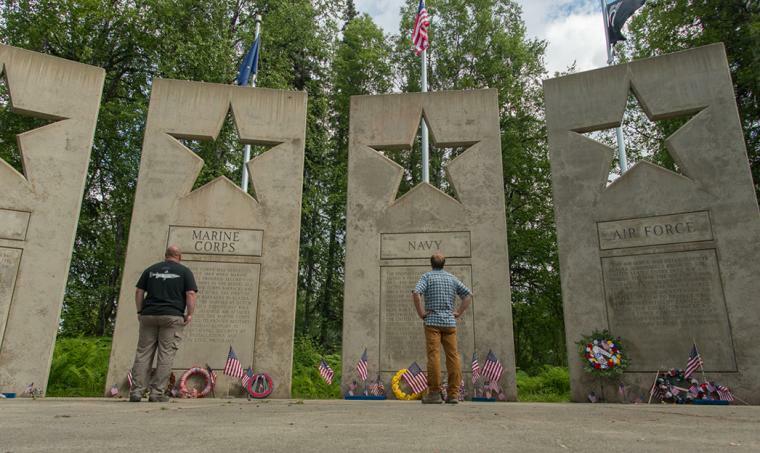 The Alaska Veterans Memorial sits on a hill overlooking Byers Lake and is a perfect spot to stop on the drive from Anchorage to Denali. There is a staffed visitor center and small book store on site (it&apos;s open Memorial Day through Labor Day), with snacks available for purchase, as well as historical displays. It doesn&apos;t take long to visit the site, but it&apos;s a stop well worth making, to honor the Alaska veterans who have served our country.